For a long time, the West has not been as united as it is right now, regarding the right path for Macedonia. After NATO’s Secretary-General Jens Stoltenberg and Austria’s Chancellor Sebastian Kurz, Angela Merkel was in Skopje today, in order to show support for the so-called Name Deal Referendum, which is scheduled to take place on September 30th, 2018. On that day, voters in Macedonia, a Balkan country of 2 million people, will answer the question whether it will be renamed ‘Republic of North Macedonia’. This compromise was reached in negotiations with Greece. In case it is confirmed in the referendum, Greece will lift its long-standing veto on Macedonia’s NATO and EU integration. More than half of all voters in Macedonia need to take part in the referendum in order to validate it. Whether a majority will vote in favor of the name change is unclear. The main right-wing opposition party VMRO DPNME has not told its supporters to vote, so far. They have been criticizing the Social Democratic government harshly, for the deal it struck with Greece, calling the latter “an act of national capitulation”. 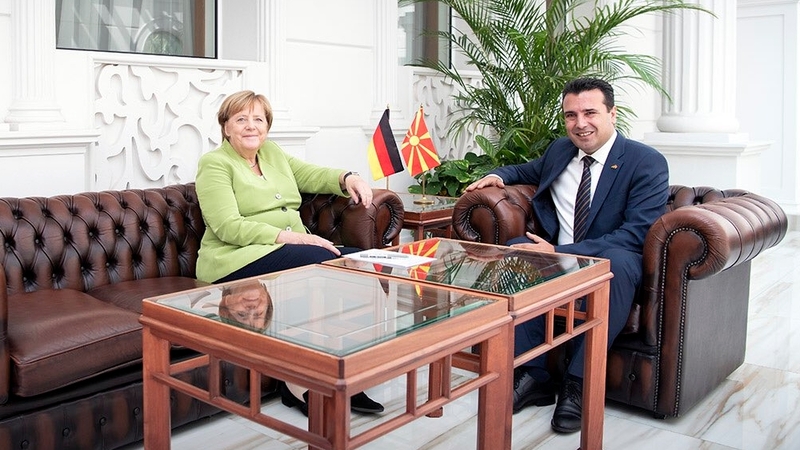 During her visit, Chancellor Angela Merkel met Prime Minister Zoran Zaev and called on Macedonia to finally overcome the name dispute. She said she did not want to interfere in Macedonia’s affairs, but knew from experience that historical opportunities did not come along every day. “From a German and a European perspective, we have a deep interest in a stable region”, Merkel stated. The Western Balkans region was crucial for the stability of the entire European Union, the Chancellor told the press in Skopje. A “successful referendum” would “open the door for Macedonia’s Euro-Atlantic entrenchment”. She called on the voters in the country not to miss what she called a historic chance. Merkel said she expected “a positive outcome”. September 30th was “a key day for Macedonia”. Greece has been blocking Macedonia’s inclusion into NATO as well es the start of accession talks with the European Union. In the meantime, U.S. President Donald Trump has commented on the name dispute between Macedonia and Greece. A printed statement distributed by the U.S. Embassy in Skopje read, the compromise agreement with Greece was historic since it would open Macedonia’s way into NATO and the E.U., a step which would “strengthen security, stability and prosperity in the region.” The statement carried Trump’s signature.